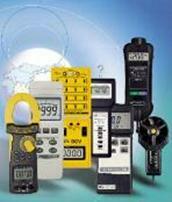 Hardness Testers | Test and Measurement Instruments C.C. Shore A Hardness Tester, for rubber-like hardness, Pocket size,. Range: 0 to 100HA, Max and Ave values. Shore C Hardness Tester, for sponge-like hardness, Pocket size, Range: 0 to 100HC,Max and Ave values. Shore D Hardness Tester, for Plastic-like hardness, Pocket size,. Range: 0 to 100HD,Max and Ave values. Rockwell B (HRB), Vickers (HV), Brinell (HB), Shore (HS), Leeb(HL) with Conversion to U.T.S. Hardness testers measure a materials' resistance to indentation. Hardness is a characteristic of a material, not a fundamental physical property. It is defined as the resistance to indentation, and it is determined by measuring the permanent depth or projected area of the indentation. More simply put, when using a fixed force (load) and a given indenter, the smaller the indentation, the harder the material. Indentation hardness value is obtained by measuring the depth or the area of the indentation using one of many different test methods. Hardness testers use one of several types of scales for determining the hardness of a sample. These include Brinell, dynamic rebound, coating or nanoindentation, Rockwell, Vickers and Knoop and ultrasonic. Methods include macro, micro and superficial testing. Brinell hardness testers are widely used on castings and forgings. This method applies a predetermined test force to a carbide ball of fixed diameter that is held for a predetermined time and then removed. The diameter of the indentation width is measured twice - usually at right angles to each other and averaged. A formula or chart is then used to convert the averaged measurements to a Brinell hardness number. Test forces usually range from 500 to 3000 kilograms (occasionally down to 1kg in less frequently used tests). In dynamic rebound or impact hardness testers, a hammer or diamond tipped probe is dropped onto a sample and the rebound height or velocity change is measured and converted into a hardness reading. The rebound height increases with increasing hardness. These tests are less destructive than conventional static indentation tests and applied where even a small indent on a surface cannot be tolerated; e.g., forged rolls for printing. Coating hardness testers use indentation, scratching or rubbing tests to evaluate the hardness or wear resistance of thin films of paint, sealants, adhesives, vapor deposits, CVD/PVD deposits or plated layers. The Rockwell test method is defined in ASTM E-18 and is the most commonly used hardness tester operation method since it is generally easier to perform and more accurate than other types of hardness testing. Rockwell testers can be used on all metals except in conditions where the test metal structure or surface conditions would introduce too much variation, where the indentations would be too large for the application or where the sample size or shape prohibits its use. The Rockwell tester method measures the permanent depth of indentation produced by a force on an indenter. Vickers and Knoop hardness testers can be used for Micro and Macro hardness testing. Typically loads are very light, ranging from a few grams to one or several kilograms, although "Macro" Vickers loads can range up to 30 kg or more. The Microhardness testing operation according to ASTM E-384 specifies a range of loads between 1 to 1000 g. There are two types of indenters; a square base pyramid shaped diamond for testing in a Vickers tester and a narrow rhombus shaped indenter for a Knoop tester. The Micro-hardness methods are used to test on metals, ceramics, and composites - almost any type of material. In ultrasonic hardness testers, a probe tipped with an indenter is piezoelectrically resonated at an ultrasonic frequency. The probe is held against the sample with a spring and a small indentation is made. The frequency of the probe changes in proportion to the contact area of the indentation. 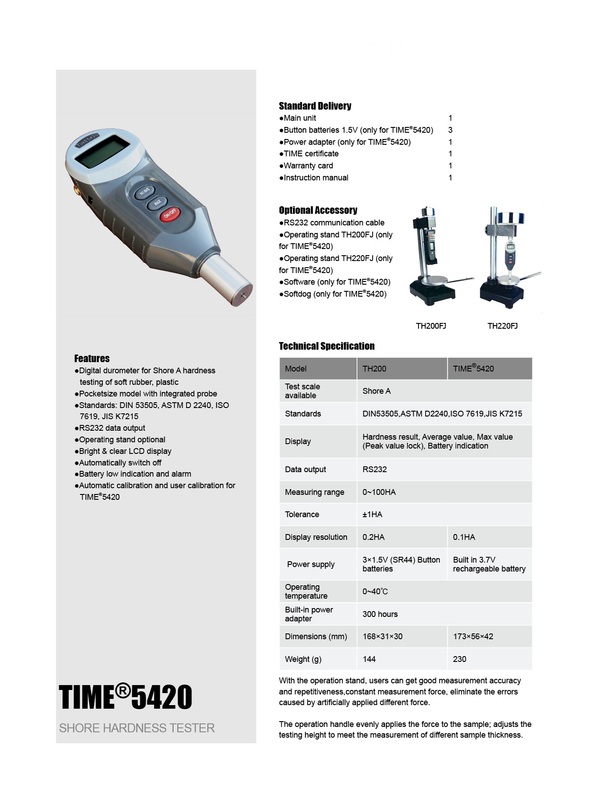 The tester measures the frequency change, then calculates and displays the equivalent hardness value. Leeb Hardness Tester with Printer, software & cable. Touch Screen. Multi-directional readings, even inverted. Measures 170 - 960 HLD & other scales. Vickers Hardness Tester. Large Touch Screen shows dwell time with Optional CCD Measuring Device, Knoop Indenter for Micro & Thin specimen, fragile material. Shore Hardness Tester. Digital Durometer. 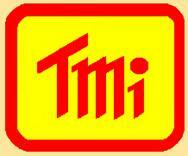 For soft rubber, plastic and soft materials. Pocket size and integrated probe. RS232 Computer Output. Hardness Testers for Leeb Hardness, Rockwell Hardness, Vickers Hardness, Brinell Hardness Shore A Hardness, Shore C Hardness, and Shore D Hardness Durometers. Hardness Tester in HB, HRB, HRC,HRA, HV, HS values. D Impact device. Test any angle. Memory - 99 Ave Readings. RS232 Output. For Thin Metal. Leeb Hardness Tester, displays hardness scales HRB, HRC, HV, HB, HS, HL. Impact device “D” 50 Reading memory. Optional RS232 , Bluetooth at time of order. Shore hardness Tester. For soft vulcanized rubber, natural rubber, thermoplastic elastomers, flexible polyacrylics, wax, felt & leather. Auto & Manual Off. Fruit Hardness Tester. (Precision Fruit Sclerometer) 20Kgf x 0.01Kgf (Kg/LB/Newton). Ideal for most types such as apple, pear, grape, strawberry, large/hard fruits, small/soft fruits. Fruit Hardness Tester. (Precision Fruit Sclerometer) 5000gf x 1gf (g/oz/Newton). Ideal for most types such as apple, pear, grape, strawberry, large/hard fruits, small/soft fruits. Pen Type Hardness Tester, Easy to use, Small, HL,HV,HRA,HRC,HRB,HB,HV, HS Standards. Repeatability Value: 0.8%. Lithium Battery.